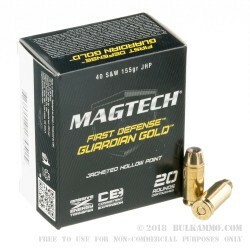 Since 1980, Magtech has produced quality, premium Self-Defense Ammunition. Based in Brazil, Magtech produces all of its ammunition at a modern factory using the latest technology. All of Magtech’s ammunition is built with quality components. From brass, to primers, bullets to casings, everything about a Magtech cartridge is built for utter reliability and accuracy. 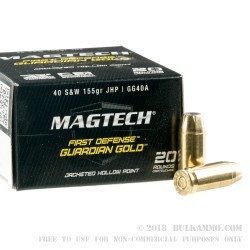 Magtech’s Guardian Gold line of ammo is designed with excellent penetration, expansion and reliability in mind. 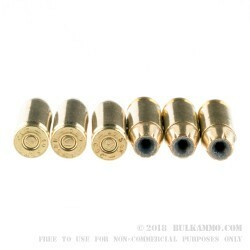 Every round of Guardian Gold is loaded with premium bullets, and utilizes quality primers for reliable ignition. This 40 SW ammunition has a muzzle velocity of 1200 feet per second and a energy of 500 foot pounds. 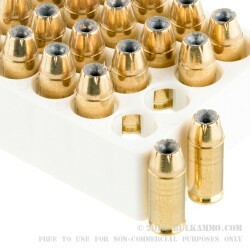 This ammo is new production, non-corrosive, with brass cases, and is boxer primed. A: This is a good load for self defense. Other excellent choices include Federal HST and Winchester Ranger Bonded.